Fire crews have been removing supplies from the fire line, such as hoses, pumps, tanks and other equipment used in structure protection. 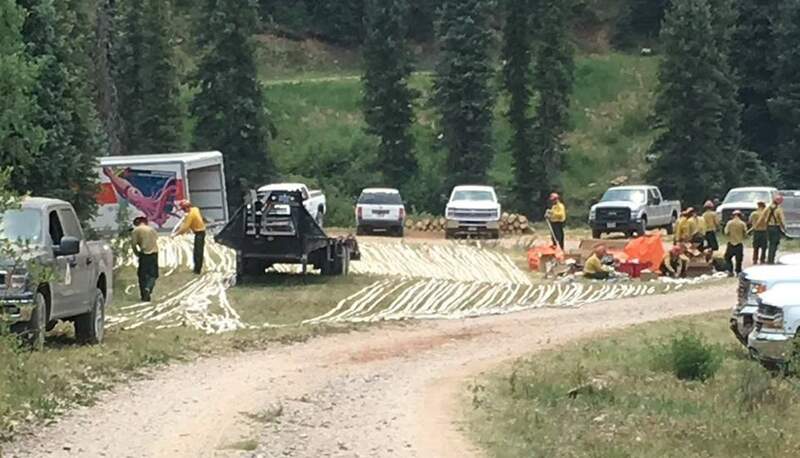 Favorable weather conditions helped slow the 416 Fire on Friday, allowing firefighters to shift their focus from fire suppression to repairing areas damaged during firefighting efforts. At the same time, forecasters say rainfall this weekend could pose a danger to the public and fire crews. The National Weather Service issued flash-flood watches until 9 p.m. Friday and from noon to 9 p.m. Saturday for areas around the 416 Fire burn scar. A public meeting to discuss potential flooding is scheduled for 7 p.m. Saturday at Miller Middle School, 2608 Junction St. A pre-evacuation notice was issued to about 250 homes in flood-prone areas Friday, but flooding had not occurred as of 8 p.m.
Small amounts of water on the burn scar can trigger debris flows, because the soil can’t hold water and there is a lack of vegetation providing erosion control. Therefore, heavy rainfall was of particular concern, said Dennis Phillips, a meteorologist with the National Weather Service in Grand Junction. Fire crews have been shifting their focus to repairing areas that were damaged during fire suppression efforts, in part to prevent erosion and rehabilitate the forest. Firefighters have known it would be unlikely to build containment lines on the western edge of the fire, which is dominated by steep and remote terrain in the Hermosa Creek Wilderness, Erikson said. In coming days, crews will perform fire suppression repair. The goal is to make the forest look like it did before suppression crews arrived on scene. Hand lines and dozer lines leave marks across the vegetation, so the majority of the work will be repairing those lines. Butch Knowlton, director for La Plata County Emergency Management, said residents should be aware if they live in a flood-prone area, and if so, pay attention to warnings issued by county and weather officials. Areas of concern include Tripp Creek and Falls Creek. Rain is forecast throughout the weekend into early next week, Phillips said. While the fire has slowed, flareups producing smoke can be expected for a while. The area inside the fire perimeter makes a mosaic pattern, Erikson said. There are blackened areas, but green areas remain that can still burn. The best thing for putting out the fire would be long, extended rainfall and high humidity. Short bursts of heavy rain are helpful, but not as much as steady rain events, Erikson said. Wash hands and body parts exposed to untreated river water or sediment with soap and water.Closely monitor children to limit accidental ingestion of untreated river water or soil. Properly treat river and stream water before drinking it.